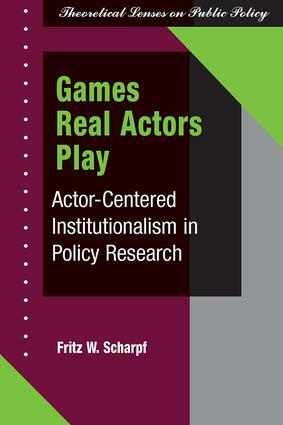 Games Real Actors Play provides a persuasive argument for the use of basic concepts of game theory in understanding public policy conflicts. Fritz Scharpf criticizes public choice theory as too narrow in its examination of actor motives and discursive democracy as too blind to the institutional incentives of political parties. With the nonspecialist in mind, the author presents a coherent actor-centered model of institutional rational choice that integrates a wide variety of theoretical contributions, such as game theory, negotiation theory, transaction cost economics, international relations, and democratic theory.Games Real Actors Play offers a framework for linking positive theory to the normative issues that necessarily arise in policy research and employs many cross-national examples, including a comparative use of game theory to understand the differing reactions of Great Britain, Sweden, Austria, and the Federal Republic of Germany to the economic stagflation of the 1970s.